Providing secure IoT network operations in the field. Kawasaki, Japan, May 28, 2018: Fujitsu Laboratories Ltd. today announced the development of network control technology that can securely operate IoT devices installed on-site. Sensors, manufacturing equipment, and other IoT devices connected to networks in on-site environments such as factories lack the capability for authentication or virus checking, leaving them open to malware attacks that result in stoppages in factory operations. This is a global problem, and existing anti-virus software often cannot be installed in IoT devices due to CPU and memory capacity restrictions, and many existing devices are exposed to threats from cyberattacks. Fujitsu Laboratories has now developed technology that analyzes and manages the interconnectivity between IoT devices and network devices, based on operating information collected in gateways, responding to successive changes in network structure to identify the communications of IoT devices behaving suspiciously. In addition, Fujitsu Laboratories developed technology to efficiently control communication blocks. If an IoT device infected with malware were to attack other devices, for example, these technologies could detect that communication by comparing ordinary communication routes, based on the relationships of connections recorded in the gateways, with the actual communication routes. Moreover, by restricting the most appropriate network device managed by the gateway, the impact of the cyberattack can be minimized. Fujitsu Laboratories aims to commercialize these technologies during fiscal 2018 as part of the gateway functionality of the Fujitsu Network Virtuora series of network products, offered by Fujitsu Limited. Recent years have seen an increasing degree of IoT adoption in a variety of industrial fields, and as IoT devices, such as sensors and manufacturing equipment, have been connected to the network, cases of these IoT devices being damaged by malware attacks have occurred worldwide. This has created an urgent need for security countermeasures for IoT devices. In many cases, however, IoT devices do not support anti-virus software due to CPU, memory, or OS restrictions, and even if anti-virus software is deployed, often software updates that require the device to be rebooted are not executed as the IoT device cannot be stopped while in operation. Due to these factors, the current situation is that many IoT devices are operating with insufficient security measures. In light of these problems, various consortiums and network device vendors have proposed measures using gateways to separate the network the IoT devices are connected to from the networks ordinary devices, such as PCs and servers, are connected to (Figure 1). 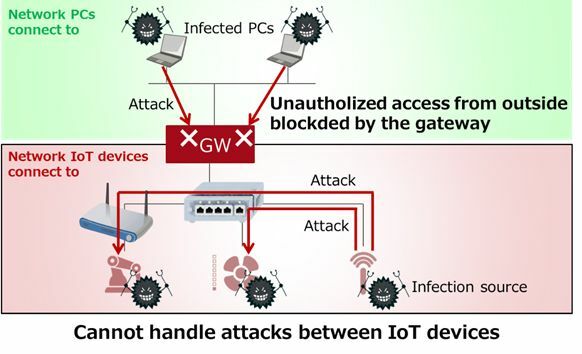 This means that the gateway can protect the devices from cyberattacks from outside networks, but because cyberattacks can be conducted without going through the gateway if a devices infected with malware is connected inside the network the IoT devices are connected to, it was not possible to protect them from cyberattacks from infected devices. 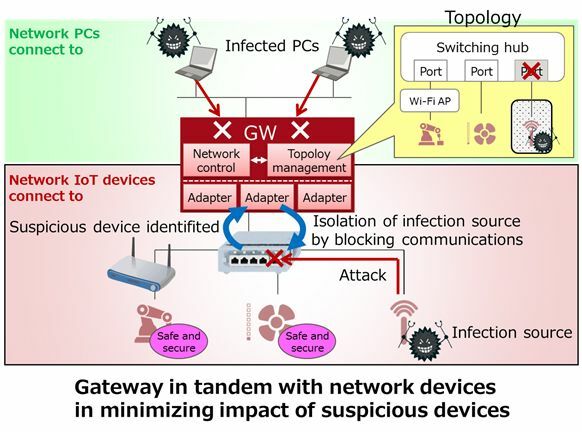 Now, Fujitsu Laboratories has developed technology that can collect operating information about IoT devices and network devices from gateway devices, deduce the topology(1) of the network the IoT devices are connected to, and appropriately control the network devices based on this information (Figure 2). With this technology, IoT devices communicating along routes not accounted for in the topology can be treated as unauthorized devices, enabling the technology to minimize the impact of cyberattacks by making those IoT devices unable to communicate with other IoT devices. This technology collects information from IoT devices and network devices about adjacent devices in a variety of formats, and then deduces the topology of the entire IoT network as it changes in real time. Because the different devices use a variety of interfaces having respective communication methods and data formats, this topology deduction is enabled by converting them all to a standardized interface in the gateway. With this technology, when IoT devices request an authorized communication route, the technology can collect the actual communication route from the network devices, discovering both unauthorized communications generated by cyberattacks and other issues, as well as the suspicious IoT devices that caused them, by comparing the authorized route with the actual route. In a simulation using fake malware, Fujitsu Laboratories operated gateways equipped with this technology in coordination with existing network devices, and confirmed that this technology could block communications from suspicious devices. The results showed that this technology could minimize the impact of cyberattacks when installed in gateways. With this technology, it will be possible to provide secure operations using existing setups, without exchanging or deploying new IoT devices with security countermeasures in sites such as factories, which require the continued operation of production equipment with long service lifespans.